Londonist is working with Sound and Music, the national agency for new music, to introduce you to some intriguing sound experiences. Continuing on our quest to have Londonist readers sample new music experiences and report back, three adventurous volunteers went to the BBC's famous Maida Vale studios last week to hear BBC Symphony Orchestra play contemporary classical music. This was a free concert, although you had to reserve your seats. Three of the composers were completing Sound and Music residencies with the orchestra and premiering new work: Tom Coult’s Codex (Homage to Serafini), Aaron Holloway-Nahum’s The Deeper Breath to Follow and Ben Oliver’s Lullaby for Joni. Emily Howard's Solar and the UK premier of Robin Holloway's In China completed the bill. Here's what our volunteers thought of the concert. What were your expectations before the performance? 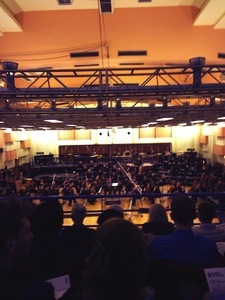 Isadora: I was very excited to see this performance I had never seen the BBC Symphony Orchestra live before and I was not aware that you could just book for free online and attend the studios at Maida Vale. Regarding the actual new compositions by new composers, I was wide open to experiencing new music and thought it would be insightful to watch an established orchestra handle new work and that it would be a unique experience. Jacob: Having been to a few Radio 4 Recordings before I knew what to expect in terms of the swift and smooth organisation by the BBC. Barima: I've long found the BBC to be highly reliable in staging musical events, so I was quite confident of an entertaining and informative evening. Generally, I anticipated an excellent all-around performance. Navin: My last foray into contemporary classical music was an eye opener as it was fairly conceptual and a little abstract and I wasn’t sure if this was going to be the same or a little more conventional. How did the performances make you feel? What did you make of it? Navin: As the orchestra played, I noticed some people closed their eyes to visualise it. I thought I would give this a go and I tried it to a piece called ‘Solar’ by Emily Howard. By doing this, you begin to feel her story. I was taken into Emily’s musical image of the sun and you begin to understand what the sun means to her. The Deeper Breath to Follow: I really loved the cow bells in this piece and the percussion elements. I expected Aaron's work to challenge the Orchestra and he did not disappoint. This piece arched incredibly and did hold together as one breath, as he described before the performance. Lullaby for Joni: This was an intense lullaby and had very loud elements which I was not sure one would play to a sleeping child. It was enjoyable and fun to watch some of the violinist faces as they created white noise by scraping the bow, something that looked quite alien even to them. It was a sound I was not sure I would like initially but it was strangely soothing overall. Solar: I did not know of any female composers before this so was ignorant in my assumption there were none. This solid six minute piece had me enraptured, it energised the room, the orchestra and the audience. In China: I wanted to hear some more Chinese elements in this piece. There were moments when it came about but as explained at the start of the work it was not about Chinese music, it was about impressions of China. It was beautifully put together and I felt at the end of it I did not want to leave the room or China for that matter, even if it was just an impression. Jacob: Lullaby for Joni: This piece is supposed to represent the time spent by a child (the composer's daughter) in the womb. Apparently white noise is the main source of noise for a child in the womb, along with some high and low frequencies, and this was conveyed very well with wind and brass being used effectively to create white noise sounds. As the piece grew with layers of texture being added one by one over a steady crescendo I actually began to feel extremely uncomfortable, feeling as though I was trapped in a womb. I was pleased when the piece had finished but also fairly awestruck at the sheer power of the music and the effect it had had on me. Solar: This reminded me of Holst's The Planets, and was written to convey the magnetic properties of the sun. Short and sweet at 6 minutes, it was a contrast to the weird and wonderful sounds of the Lullaby previously. I was relaxed and drawn in by the hypnotising force of the piece, which grew to a head and then finished with one note that was held and resonated until it died - a very fitting climax of a homage to something that although so critical to human life but that feels just so intangible and distant from most of us. In China: I was disappointed by the piece because you could tell the composer was trying to convey a short trip in a short space of time (the piece was 20 minutes long). With different sections trying to convey different aspects of China, such as the vast agricultural lands and the tall, burgeoning skyscrapers of Shanghai, it all seemed a bit forced. Exciting as the piece was, I would rather have delved deep into some minute detail. Seeing a concert in a recording environment with bright lights was quite a contrast to the usual dimly lit concert hall - this had a strange effect and I would have preferred it if the lights were dim so we could focus on the orchestra and conductor! Was it accessible? Did you need specialist knowledge to enjoy it? Isadora: Very accessible and no prior knowledge needed at all just an open mind and ears! Barima: I found it quite accessible - only a general interest or curiosity about classical performance was required. Navin: I wouldn’t say that any specialist knowledge is needed to enjoy any of the pieces but knowing a bit of background to each piece definitely helps immerse you into the story. Luckily, before each piece the composer gives you a bit of background and tells you about their influences. This description provides the listener with both the imaginative and all the technical means of access to the music. Jacob: I didn't have a programme for the first and second of the pieces, so I hardly took them in and failed to grasp an understanding of what they were really about (because I wasn't listening intently for things I'd read about I can barely even remember them). Fortunately though the third, fourth and fifth pieces presented huge musical variety and experimentation that I could listen to in context, having been given a programme. Would you recommend the experience to your friends? Isadora: Yes I think everyone should know about the BBC Symphony Orchestra and new composers. Barima: Yes - in fact, one or two were quite interested (after the fact!). Navin: You don’t get much for free, especially in London. The event lacks the glitz and glamor that you could find in some other concert halls but those in question don’t offer you the opportunity to try something completely new for free. For this fact alone I would recommend it. If you love it, pay to see a piece at the Barbican of the Royal Festival Hall, if you didn’t, you haven’t spent a penny. Something different, something new, I had a good time. Many thanks to our samplers, Jacob, Isadora, Barima and Navin. Interested in more events like these? Browse listings in The Sampler. See what our samplers made of Space F!ght, the Orchestra of the Age of Enlightenment’s Night Shift, London Sinfonietta playing Stockhausen, and the contemporary classical club nights Nonclassical and Blank Canvas.